Home Cosmetic Dentistry Are You a Candidate for Same Day Dental Crowns? A dental crown helps to protect a tooth that’s otherwise damaged, such as a cracked tooth or a tooth that’s seen extensive decay. In the past, dental crowns were part of a restoration that could take weeks to complete. However, new technology is allowing patients to go home with their permanent restoration that same day. Same day dental crowns eliminate the need for several dentist visits to restore your tooth and the need for a temporary crown. Are you a candidate for this procedure? Same day dental crowns are possible through a technology called CEREC, which stands for Chairside Economical Restoration Esthetic Ceramics. CEREC has been in use for more than 30 years and the technology of same day crowns has evolved to provide restorations that rival the quality of traditional dental crowns . crowns. These include people who have broken teeth, teeth that have advanced tooth decay, and even chipped or worn-down teeth. Although nearly everyone who qualifies for traditional dental crowns will qualify for same day dental crowns, CEREC might not be a good fit for everyone. Your dentist might not recommend same day crowns if you need several dental crowns placed. Same day dental crowns might also not be a good fit if the tooth needing the crown is in the front of the mouth, as same day crowns won’t give your dentist a full range of options for creating the most natural result to match your other teeth in regards to color. Regardless, your dentist will evaluate your smile and recommend the best option for you based on what you need! 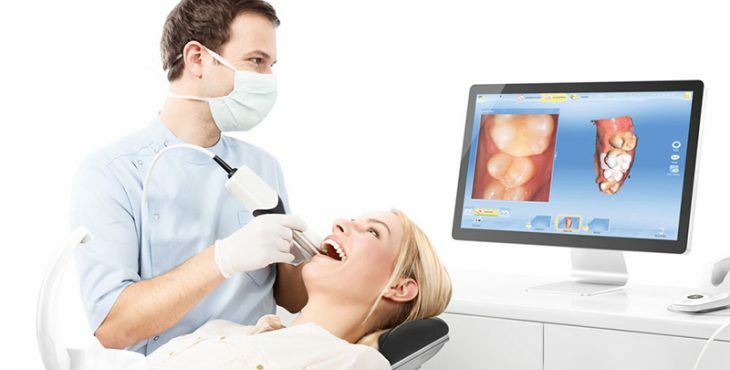 There are many benefits of CEREC technology that appeal to patients. Typically, when you need a dental crown, your dentist takes impressions and sends them to an outside lab where the restoration is made. Then, you’d return to your dentist to get the restoration fitted. This process could take two weeks and in the meantime, you’d need to be fitted with a temporary dental crown. However, with same day dental crowns, your dentist is able to make your new custom dental crown in-office. Your dentist will take 3D images of your mouth and the machine will read your scans and make the crown right then and there. Dental crowns help preserve teeth and their roots, minimizing the chances of future damage and eliminating the need for an extraction. With the right care, dental crowns make teeth stronger, approve appearance, and can last for more than 10 years . If you need a dental crown, ask your dentist about same day dental crowns to restore your smile in just one visit. While same day crowns won’t be the right fit for every person, most patients can take advantage of CEREC technology to improve their smile! Next articleHow Can Dentists Treat a “Gummy” Smile? Dr. Mazhari has been serving patients in the Northern Virginia area for over 15 years and is known for her compassionate, caring manner and comprehensive approach to your dental care. She strives to build a lasting relationship built on patient focused dentistry and mutual trust.